Reposting two recent articles here. The first is a bit long, click the article if you want to see the full paper. Enjoy. Is China’s Use Of Coal Really Declining? Chinese power generation is overwhelmingly dominated by fossil fuels, which accounts for 90% of capacity, coal itself accounting for 67%. Renewables account for the remainder, with this 10% being dominated by the 8% of hydro. Nuclear is 1%, solar and wind 1%. It is obvious from these facts that the great growth in solar is possible only because the growth starts from a very small base, though such is the absolute size of the Chinese economy that this tiny fraction of its capacity is very large by comparison to other countries’ solar industries. Even leaving aside the question of how much the Chinese renewables industry is directed towards export, it is equally obvious that even the current great growth in solar can have only a small marginal impact on the Chinese energy mix. It is justifiable to claim that China plans to raise the share of renewables in the energy mix to 20% by 2030, of which solar will provide a small fraction, and to cap coal at less than 62.5%. But it is preposterous to claim that this represents a movement from coal to solar that has any real significance for global emissions. In brief, the planned shift in the energy mix cannot possibly represent peak coal because it is part of a plan to absolutely increase coal-fired generation. Yet again, the concept of carbon intensity is causing dreadful confusion. Even if this shift (and the installation of new fossil fuel plant) lowers carbon intensity, this will be brought about, not in reversal of, but in the course of continued growth in Chinese power generation and therefore of coal-fired generation. There is simply no possibility, other an unforeseen economic catastrophe or a technological miracle, that Chinese coal consumption will not grow by absolute amounts that are astronomical by western standards, and to a concomitant rise in emissions…. China’s strategic target, restated in its statement to the UNFCCC Secretariat of its Independent Nationally Determined Contribution, is to create ‘a moderately prosperous society’. Under the current Five Year Plan, this is to involve doubling 2010 gdp and per capita income by 2020, which will be made possible by a concomitant increase in power generation, with 2010 energy consumption expected to double by 2030. Even accepting that the share of renewables in the energy mix will double and that of coal decrease by 5%, elementary arithmetic shows that coal-fired generation will itself almost absolutely double. Let us give overall power generation the value of 100, of which 90 is fossil fuels (67 coal) and 10 is renewables, and then add another 100, of which 20 is renewables and therefore 80 is fossil fuel (62.5 coal). The shift to renewables has but the smallest impact on an absolute growth of fossil fuels to 170 and coal to 129.5…. It remains only to add that nothing has been said here about the position of India, which in 2014 overtook the US as the world’s second largest coal consumer. Germany’s Volatile Power Grid Spinning Dangerously Out Of Control …Prices Go Negative 25 Times In 2015! The more volatile supply wind and solar energy that comes online in Germany, the more insane the market prices become. Too often the wind blows and the sun shines when power is unneeded, or they are simply AWOL when demand is high like in the wintertime. Germany’s wildly fluctuating wind and solar energy are creating grid and market havoc. Earlier this month Germany saw a spate of both sunny, windy days, thus leading to huge power grid surges during the Ascension holiday weekend, a time when many factories were running close to idled (see chart above). Another debilitating feature of the weather-dependent renewable energies are the havoc they create on the electricity exchanges. Last week’s power grid overloading by wind and sun led to deep negative wholesale prices. Spiegel here writes that the wholesale power price plummeted to -130 euros per megawatt (see blue curve in the right chart)! Literally, foreign consumers were being paid to take the power. (The black curve shows total German demand). Moreover the phenomenon of negative wholesale prices (i.e. excessive power feeding uncontrollably into the grid) occurred a record 25 times in 2015, Spiegel writes. That was 4 times more often than in 2011. With wholesale electricity prices dipping into negative territory, one might think that power must be very cheap for the consumer. Unfortunately this is not the case. At negative prices power companies lose money, and so are then forced to pass along these extra costs along to the end consumers. German consumers are paying close to €0.30 for each kilowatt-hour they consume – among the highest in the world. The situation has gotten so alarming that leading politicians of Chancellor Angela Merkel’s CDU conservative party are now demanding an end to subsidies for new wind and solar installations. * This is my article in BusinessWorld last May 25, 2016. Last Tuesday, May 24, I took a boat from Manila going to Bacolod. This is after nearly 2 decades of riding the plane when I go back to my province in Negros Occidental. I was surprisingly happy that I took that decision. Things are so different now compared to two decades ago, from Manila's seaport terminal to the boat itself. This was my boat, 2GO's St. Therese. Huge boat, a smaller version of those giant cruise ships. I wanted to take the plane, went to Ticket Express days before. Cheapest fare for either Cebu Pac or PAL was almost P3,400, next 5 days flights, plus P200 terminal fee at the airport, nearly P3,600 total. My money was not enough that day, so I asked for a boat fare, P1,985 all in, with 4 meals (1 brkfast, 2 lunch, 1 dinner). Terminal fee was P95, ok na. I saved about P1,500 + a new experience. Negros Navigation (NN), used to be the monopoly for boats plying the Bacolod-Manila route, around 3-4 decades ago and earlier. It also served the Iloilo-Manila route. 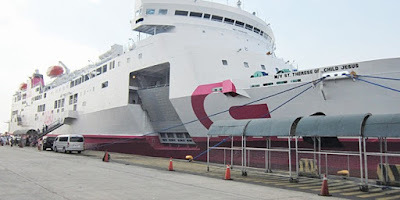 Then Super Ferry (owned by Aboitiz shipping?) came and there was competition. 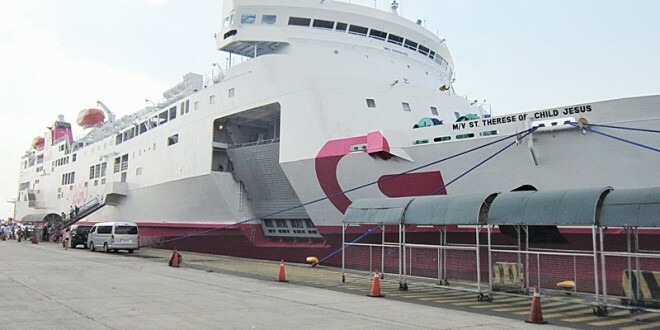 Later 2GO emerged, a merger of NN, SuperFerry, plus 1 or 2 other domestic shipping companies. By then, competition has shifted to another level. 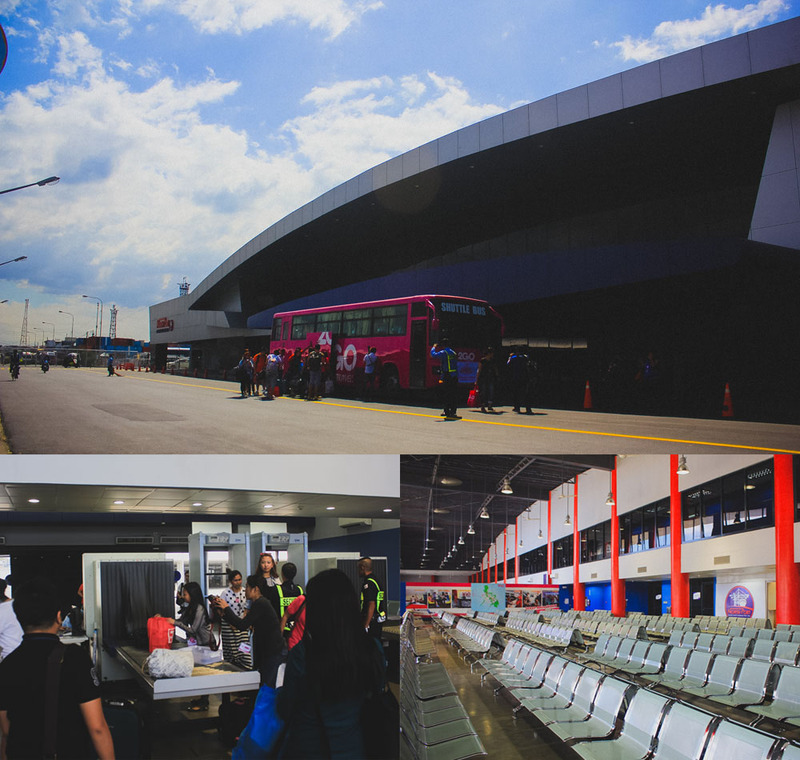 Inter-island shipping vs. budget airlines vs. RORO bus lines. So passengers have more choices. North Port terminal, a lot more modern than 2 or 1 decade/s ago. 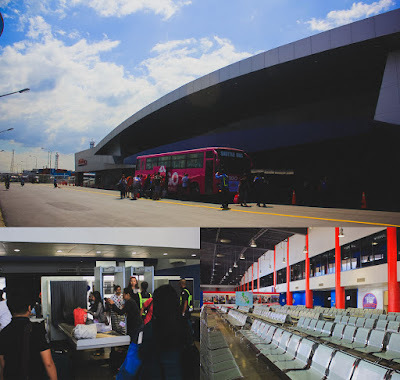 Terminal fee is P95 per passenger, nice but may not be justified because passengers seldom or do not stay there, they just check in, pass by the departure lounge, straight to a waiting bus that will bring them to the boat. Total stay of about 5 minutes only at the terminal. Inside St. Therese boat, the facilities are clean and nice. Fiesta resto for those in the economy, tourist, classes. The is a karaoke bar nearby, a bar with live band performing at night just adjacent to the restaurant. There is another restaurant for passengers in the business, cabin, state rooms. The tourist class room where I stayed. 12 beds per room, double deck, air-con, with own flat tv. Each bed has own reading light, comfortable enough. Roofdeck, people promenade here casually, day time or night time. 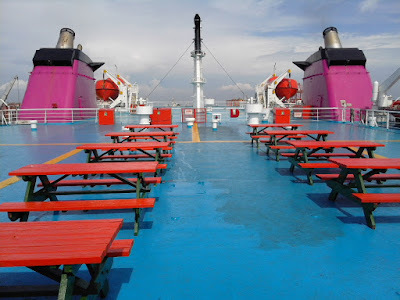 Iloilo port, for big boats only. The fast craft boats (Iloilo-Bacolod) have their separate port, on the mouth of Iloilo river, near the city center. The boat unloaded passengers, then take Manila-bound passengers. Instead of a 20 hours trip, it becomes a 27 hours trip. But at least I was comfortable in the room. All my 4 roommates that day got off, another passenger going to Manila came in. The boat's crew are mostly young, courteous. The trip was good value for money for friends and families, they can bring their own food and have a picnic at the roofdeck, resto, aisle, etc. There is free unlimited hot water at the resto. For the bashers saying that "no change for years, now there will be change", huli pala kayo or tayo sa balita. Madami na changes, good improvements how some firms give comfortable sea travel for the people. Meanwhile, further liberalization of domestic shipping, allowing foreign shipping lines to ply some domestic routes, we need that. Domestic firms will complain of course, but we ordinary customers and passengers want more choices, government must not put a hindrance to this. Energy 67, Helios solar power in Cadiz City, Negros Occ. I am from Cadiz City, Negros Occidental. Our house is not at the city proper but in a barrio along the national road, same barangay, about 3 kms. 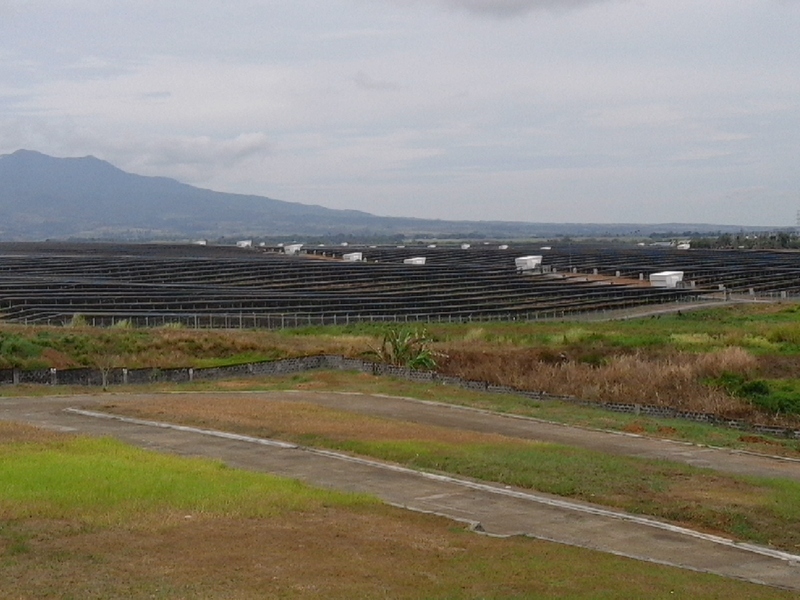 from the famous, biggest solar power plant in the Philippines and SE Asia. Am here to visit my sick father in the hospital. The other day, I went around and visited the facility, just outside. 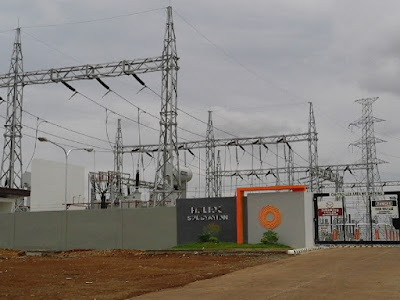 The National Grid Corp. of the Philippines (NGCP) put up a sub-station there, so that power generated from the plant is directly fed into the grid. Solar, wind, biomass, run of river hydro are priority dispatch in the grid, based on the RE law of 2008 (RA 9513). 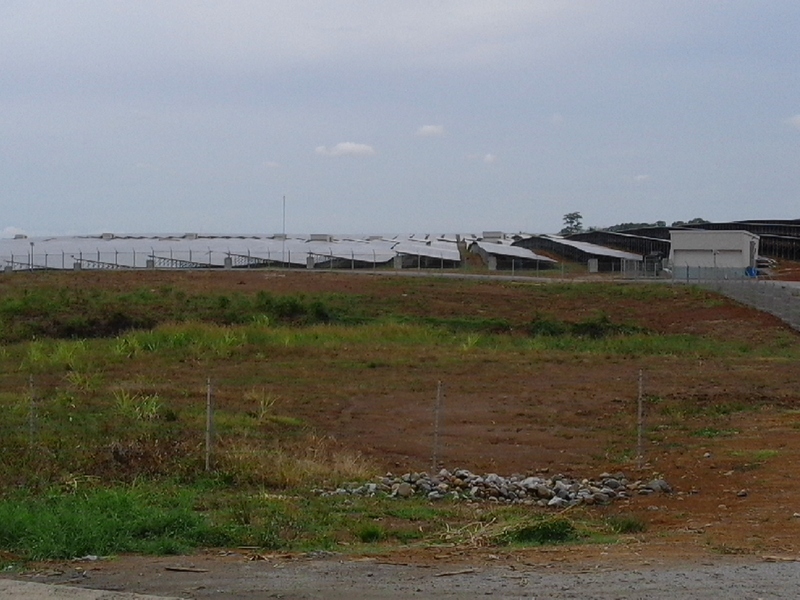 The area used to be a sugar cane farm. 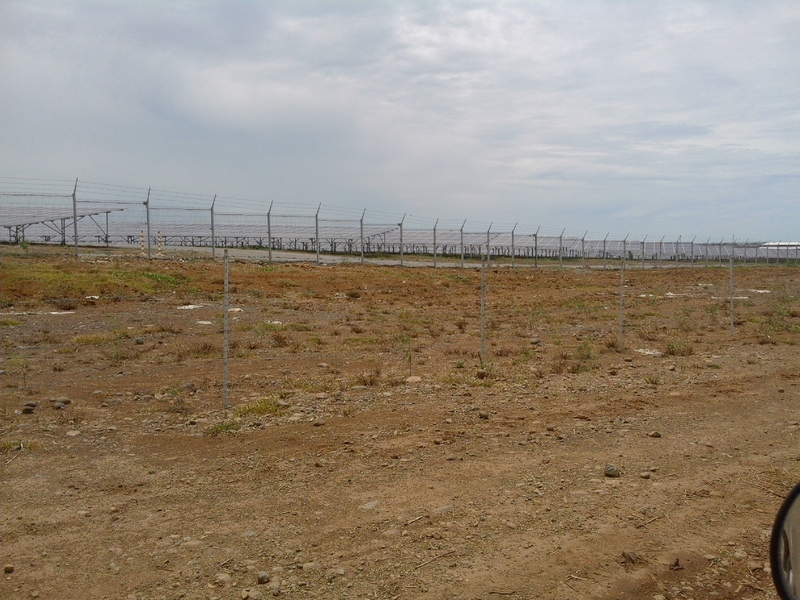 The plant's rated or installed capacity is 132 MW, quite big, occupying some 176 hectares, cost P10 billion. Perhaps the area is larger, if the buffer zone between the two fences is included. 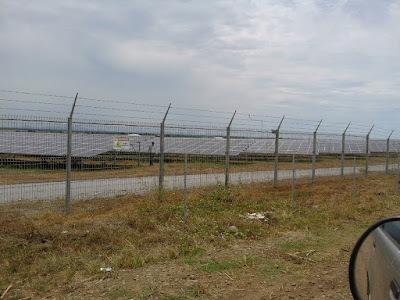 The usual ratio for solar is 2 hectares of land per 1 MW of installed capacity. This is the view from St. Peter's The Garden memorial garden. My mother was buried here last year. 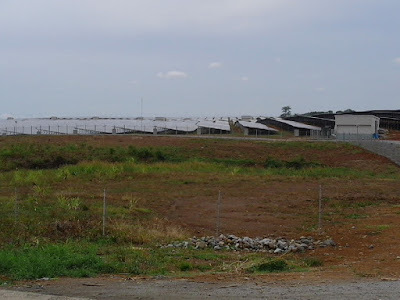 Notice something -- no trees around the solar farm. Not one. At the background are several mountains, Mt. Silay, etc. A view from outside the gate. The guard allows taking photos outside the perimeter fence. Again, not a single tree is allowed. Solar power's main "enemy" is shade -- from clouds and tall trees -- they immediately bring down solar output. The view from a road going to/coming from Hda. Paz proper. 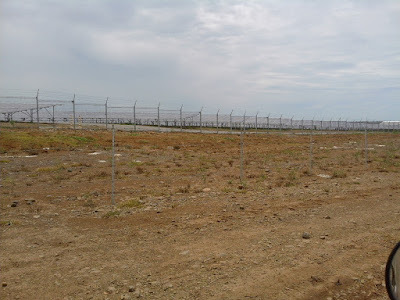 Two fences, outside fence is ordinary wire, fence inside is electrified + there are roving guards. Another view from a road going to Hda. Paz. 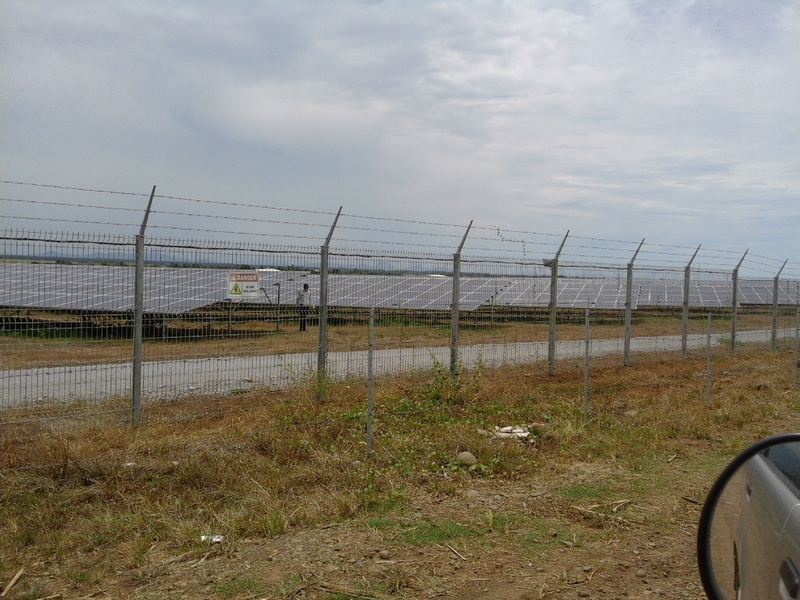 Some locals there say that if it's a cloudless day, the heat reflected back by the solar panels can be felt by them. Others say they don't feel such extra heat. Helios power was inaugurated last March 03, 2016. 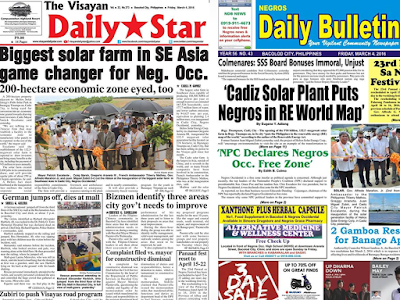 It was big news in Negros and in some national newspapers. The personalities who graced the opening included Cadiz City Mayor Patrick Escalante, Negros Occ. Governor Alfredo Maranon, the owners of the plant, French Ambassador in Manila, incoming Sen. Zubiri. Again, I am not against solar, wind, biomass, etc. What I am against are the various subsidies, fiscal favoritism that are given to them but not to coal, natural gas, geothermal, big hydro. 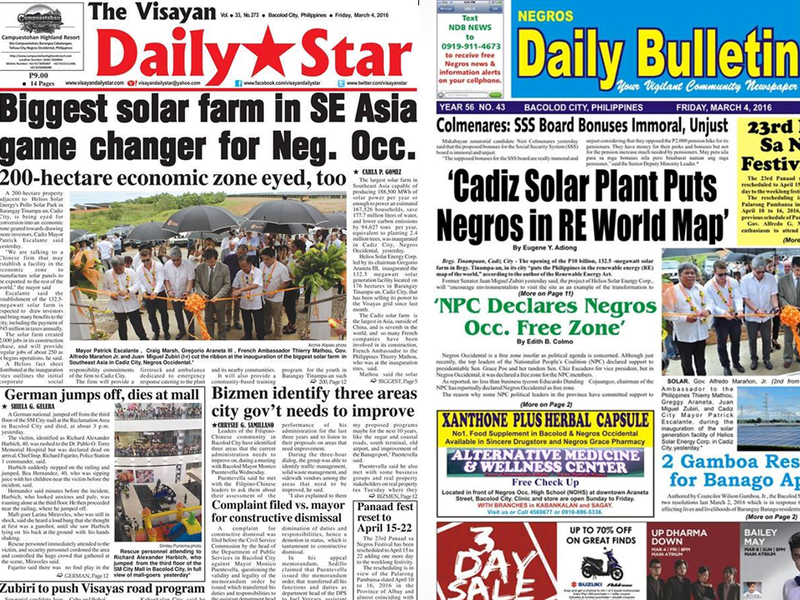 Meanwhile, other environmentalists should notice the contradiction between their "plant trees to save the planet" campaign vs solar plant's "no tree/s allowed to save the planet." 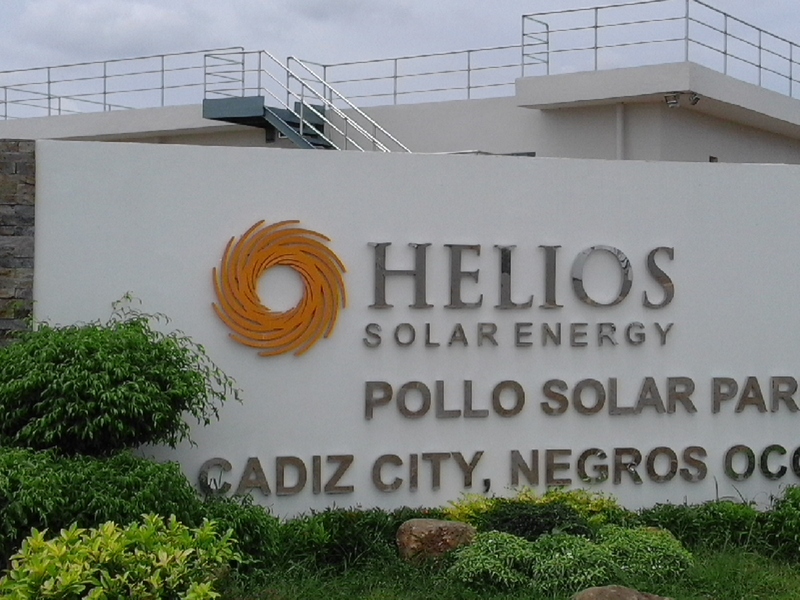 Labels: Cadiz City, Helios power, Negros Occidental, solar energy. 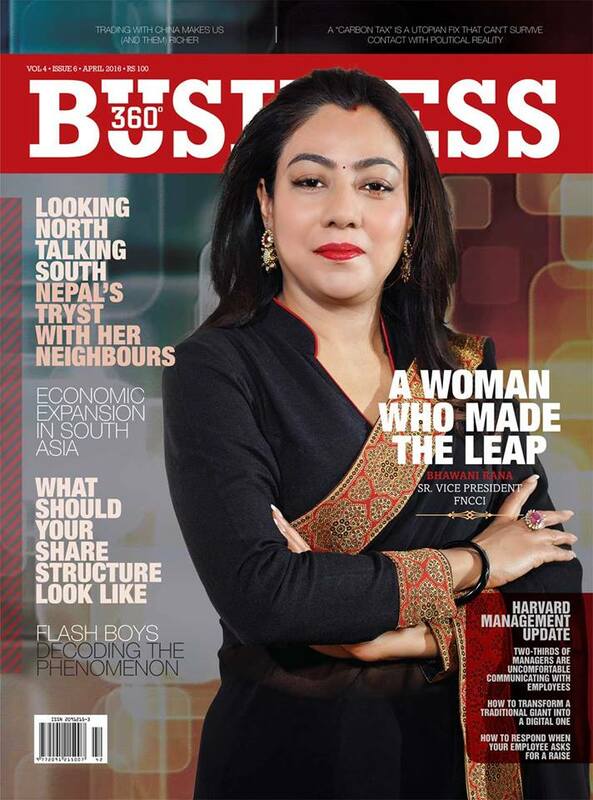 * This is my article for this monthly magazine in Kathmandu, April 2016 issue. South Asian economies are a picture of high diversity in human and natural resources. While India has 1.3 billion population, Maldives and Bhutan have a combined population of only 1.2 million people. And while Nepal and Bhutan are high up in the sky, Maldives and many Sri Lanka cities are just a few meters above sea level. It is this diversity that provide South Asian economies good opportunity for growth and modernization. There is only one Himalayan mountain range in the planet and they are in the region. The beach resorts of Maldives and some in Sri Lanka are world class. And more needs to be done, like the infrastructures to develop modern ski resorts and cable rides in the Himalayas in the future need to be laid out now. The need for more airline liberalization and competition, airport modernization and electricity supply stabilization, should be put in place too. 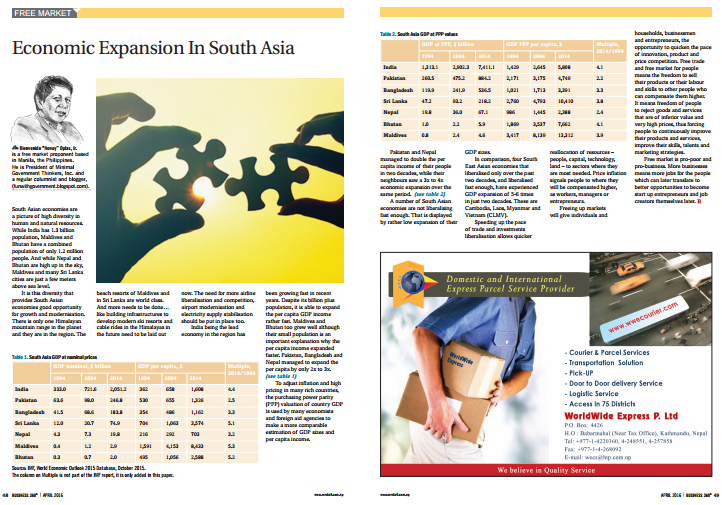 India being the lead economy in the region has been growing fast in recent years. Despite its billion plus population, it is able to expand the per capita GDP income rather fast. Maldives and Bhutan too grew well although their small population is an important explanation why the per capita income expanded faster. 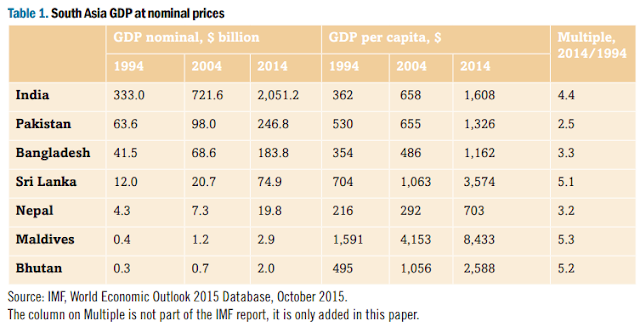 Pakistan, Bangladesh and Nepal managed to expand the per capita by only 2x to 3x. To adjust for inflation and high pricing in many rich countries, the purchasing power parity (PPP) valuation of country GDP is used by many economists and foreign aid agencies to make a more comparable estimation of GDP sizes and per capita income. Pakistan and Nepal managed to double the per capita income of their people in two decades, while their neighbors saw a 3x to 4x economic expansion over the same period. A number of South Asian economies are not liberalizing fast enough. That is displayed by rather low expansion of their GDP sizes. In comparison, four South East Asian economies that liberalized only over the past two decades, and liberalized fast enough, have experienced GDP expansion of 5-6 times in just two decades. These are Cambodia, Laos, Myanmar and Vietnam (CLMV). Speeding up the pace of trade and investments liberalization allows quicker reallocation of resources – people, capital, technology, land – to sectors where they are most needed. Price inflation signals people where they will be compensated higher, as workers, managers or entrepreneurs. Freeing up markets will give individuals and households, businessmen and entrepreneurs, the opportunity to quicken the pace of innovation, product and price competition. 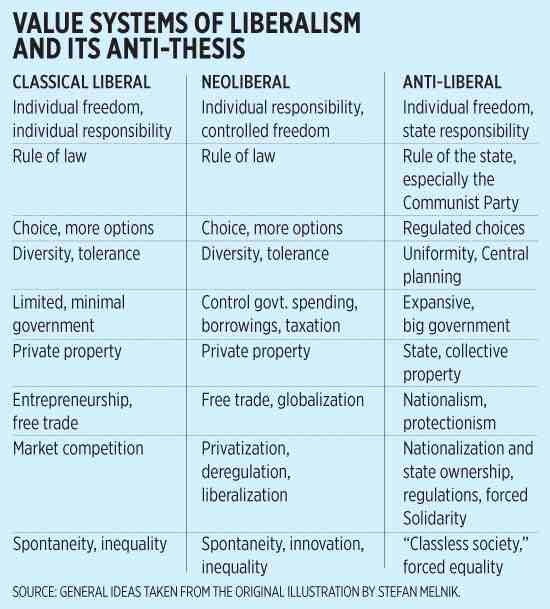 Free trade and free market for people means the freedom to sell their products or their labor and skills to other people who can compensate them higher. It means freedom of people to reject goods and services that are of inferior value and very high prices, thus forcing people to continuously improve their products and services, improve their skills, talents and marketing strategies. Free market is pro-poor and pro-business. More businesses means more jobs available for the people, which can later translate to better opportunities to become start up entrepreneurs and job creators later. * This is my article in BusinessWorld last May 19, 2016. Among the noticeable things when I buy in public markets is the presence of Norwegian salmon. Usually the salmon heads or salmon belly are available, and their retail price is not that far from bangus or tilapia. So while it is common to see Norwegian salmon in big groceries and supermarkets, it is good to see the presence of this Norwegian product in public markets at affordable prices, implying that trade of this commodity is increasing fast. And that proves further that free trade is good. The taste of salmon is a lot different than many tropical fish products that we have. Free trade allows the poor and lower middle class to enjoy this produce from time to time. 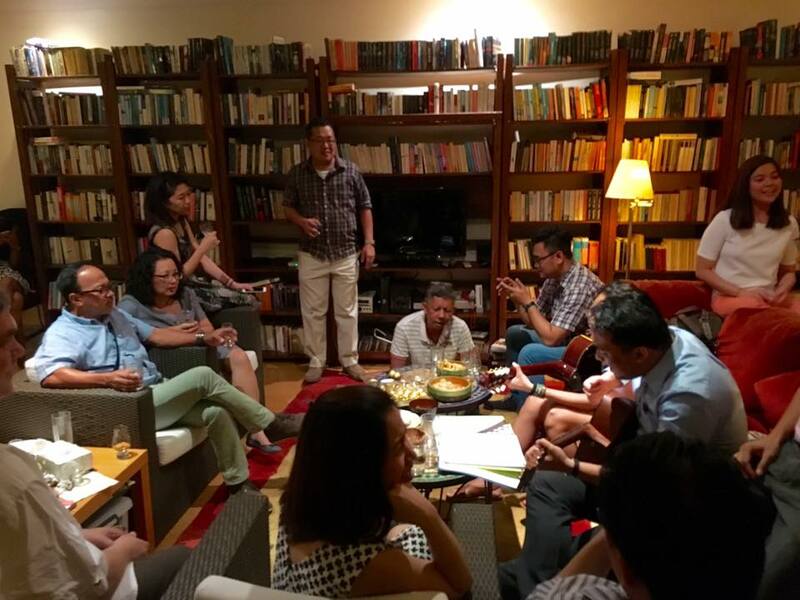 Last May 14, 2016, I had the opportunity to meet and break bread with some Norwegian businessmen and Filipino managers running Norwegian companies in the country. It was at the celebration of Norway’s Constitution Day. I checked the data from the UN Conference on Trade and Development, “Bilateral FDI Statistics 2014.” Instock investments from Norway is still small, only $7 million as of 2012. The biggest investments are from UK ($1,418M), France ($310M), Switzerland ($239M), and Denmark ($197M). Nonetheless, the flow of trade and investments between Norway and the Philippines is rising. 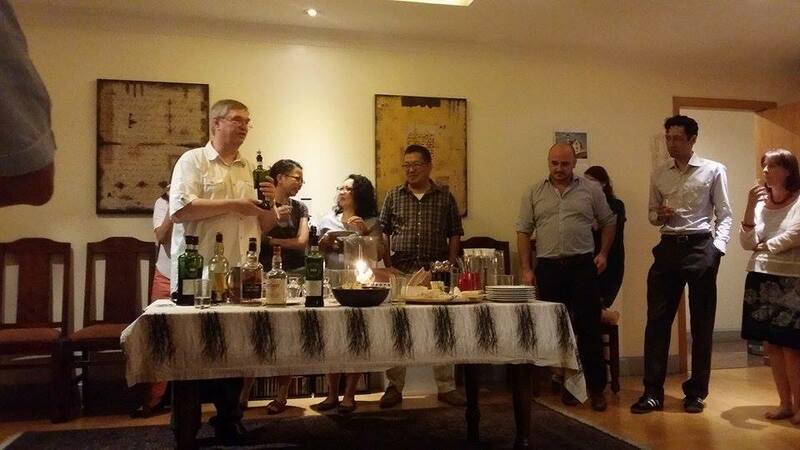 First, the Norwegian embassy, promoting diplomatic, cultural and economic partnerships with the Philippines. I met the Norwegian Ambassador to the Philippines, His Excellency, Erik Forner and I asked him what are the key business sectors where relations between Norway and the Philippines are most active, and he quickly mentioned the maritime industry. Many Norwegian businesses operating in the Philippines are shipping-related. 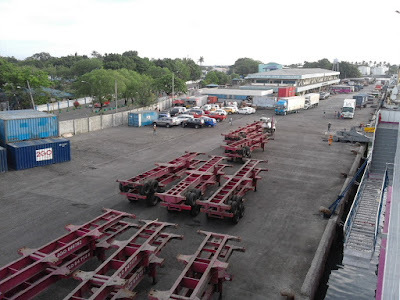 Norwegian shipping companies are among the biggest employers of Filipino seafarers, about 25,000 of them, aboard their ships or in shipyards abroad. They also have the Norwegian Training Center in Manila that provides relevant and specific training for Filipino seafarers working on Norwegian ships. Then the Norwegian Maritime Authority is working with the Philippines’ Maritime Industry Authority in ensuring that maritime/seafarer education is in compliance with international standards. Second, the Philippine Norway Business Council, a young organization that promotes bilateral business opportunities between the two countries. Established on 5 January 2011, the Council is a direct result of a common initiative from the Norwegian business community in the Philippines. The objective was to create a forum or a platform of interaction for Norwegian companies represented in the Philippines, Philippine companies with links to Norwegian businesses, and individuals involved in Norwegian companies. Third would be the Norwegian companies themselves that have come into the country to partake of opportunities presented by the Philippines business environment. One of these companies is Norconsult -- one of the oldest Norwegian companies in the country specializing in project management services for engineering projects in the transport, energy, and urban & regional development sectors. 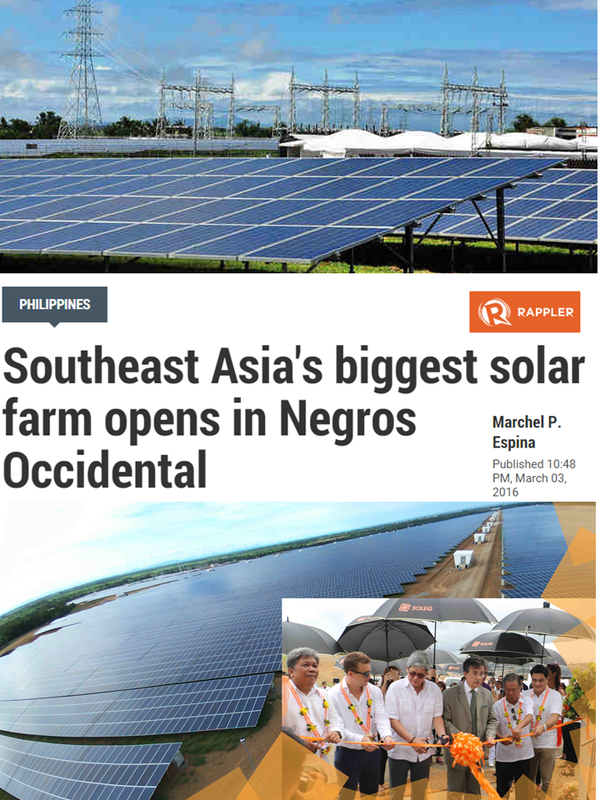 Norconsult’s first Filipino Managing Director for its Philippine subsidiary, Rodolfo “Ozone” T. Azanza, Jr. said that their manpower complement has expanded almost three times in less than two years, signifying the expanding business opportunities for his firm, that in turn also create more jobs for Filipinos. He also said that the best export of Norway to the Philippines is their strong practice of business integrity. By practicing it locally, it gives a good business case, attracting clients and employees who live by the same principles. Here is a snapshot of the social and economic conditions of the Philippines and Norway, rather incomparable in many aspects but are welded by trade and investments (see table). On April 28, 2016, the four European Free Trade Area (EFTA) states composed of Iceland, Liechtenstein, Norway, and Switzerland, signed a free trade agreement with the Philippines in Bern, Switzerland. The EFTA-PH Free Trade Agreement (FTA) is a broad-based agreement covering trade in goods and services, investment, competition policy, intellectual property rights protection, government procurement, and sustainable development. Specifically, EFTA abolishes all customs duties on industrial products from the Philippines upon implementation, while the Philippines will gradually lower or abolish its duties on the vast majority of such products coming from EFTA. That trade agreement may bode well for a similar future agreement with the continent’s bigger economies like Germany, France, and UK. A possible Philippine membership in the US-led Trans Pacific Partnership Agreement will also be a good thing, before a FTA with huge EU economies. In trade, the best route is unilateral liberalization, just open the borders and regulate only those products and services that can cause harm to public health and safety. Like guns and bombs, poisonous substances, substandard medicines, etc. However, only a few economies have succeeded in having such policy, like Hong Kong, Singapore, UAE, and Chile. So the second-best policy is via regional and bilateral FTA. Empowering the local consumers and producers with more choices where and from whom to buy and sell is empowering the people, expanding their economic freedom and individual liberty. Bienvenido S. Oplas, Jr. is the head of Minimal Government Thinkers, a Fellow of SEANET and member of EFN-Asia that promotes free trade. Energy 66, What companies receive FIT and by how much? 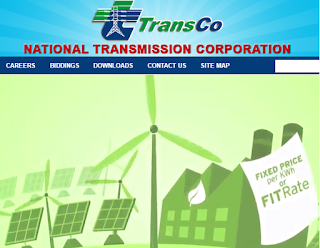 This is the subject of my letter to the National Transmission Corporation (TransCo) last Monday. TransCo is a government corporation that owns all the transmission assets of the government. Among its five key responsibilities is to administer the Feed-in-Tariff Allowance (FIT-All) Fund for renewable energy (RE) generators. Its website clearly and proudly discusses the FIT system and why it is "good" for electricity consumers because of its "merit order effect". I would like to request for data on (a) list of RE companies that have received FIT, 2015-2016, (b) how much each company received, (c) total FIT payment, (d) related data that you may want to share. I will use the data for a research paper that I am writing for our think tank, Minimal Government Thinkers, which I hope to send you and the DOE a copy, and a short version for my column in BusinessWorld. I assume these are public data as the money collected is taken from electricity consumers nationwide. President, Minimal Government Thinkers, Inc. I would like to ask if you can share this data with me. Still no reply. Ahh, this must be among their "top secret" data perhaps? One problem with the absence of a Freedom of Information (FOI) law or Exec. Order is that certain government offices can only collect-charge-bill-fine us ordinary people and when we ask where the money went to, they can only give one standard reply, the Sound of silence. 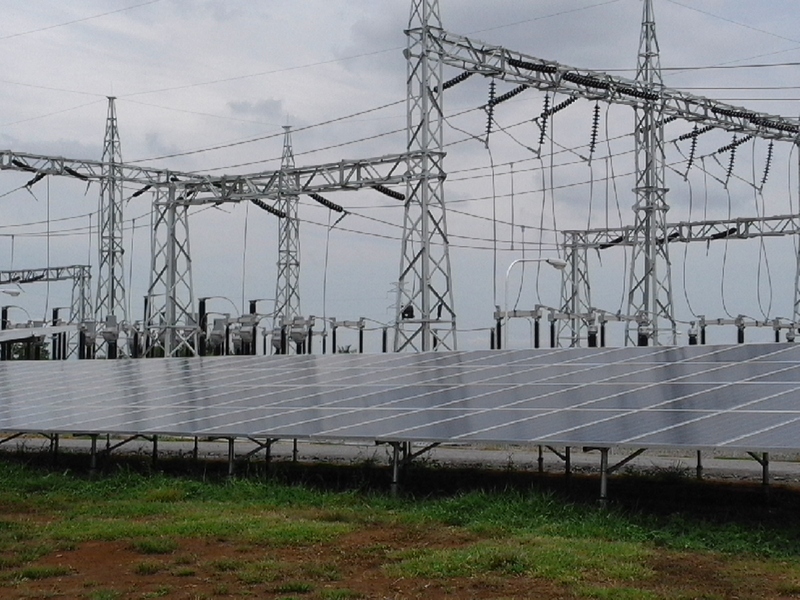 "FiT subscriptions for RE resources have significantly increased to 806.82 megawatts (mW) from 646.65 mW installations since the start of 2016. The following are the FiT subscriptions to date: Biomass has 11 power plants with a total capacity of 94.25 mW; hydro has four accounting for 26.6 mW; wind has six accounting for 393.9 mW. 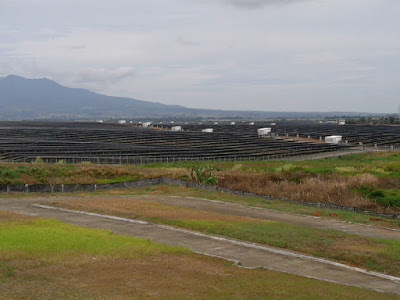 Meanwhile, as of March 15, 2016, the DOE issued Certificates of Endorsement for FiT Eligibility (COE-FiT) to 11 solar-power plants accounting for 292.07 mW to the Energy Regulatory Commission (ERC). 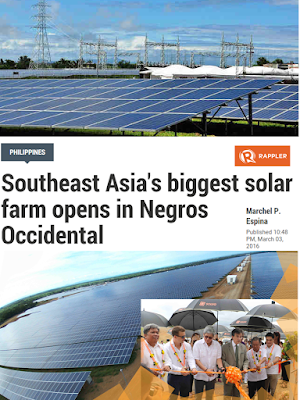 More solar-power projects may be issued COE-FiT at the completion of the ongoing validation and assessment of the submissions received by the DOE in relation to the March 15 deadline for the expanded FiT for solar-power projects." I just want to know who are those 6 wind plants, 11 solar plants, etc. 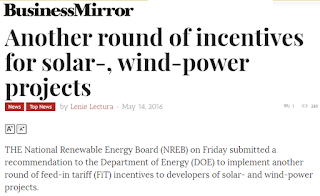 and how much did they get from the 4.06 centavos/kWh that we consumers paid to them from February 2015 to March 2016. 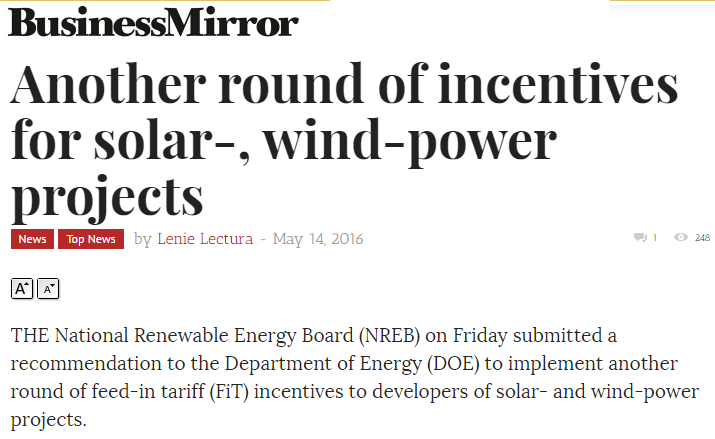 The FIT has been raised to 12.40 centavos/kWh starting April 2016. Expensive electricity is lousy. Making it even more expensive with extra charges like FIT-All is lousier. And when we ask who are these companies that receive the extra charges, the answer is a Sound of silence. Hi TransCo, I still hope to receive a reply from you. I hope to write another paper about you soon, whether you give a reply (and some data) or not. You will receive this blog post via email, fb, twitter, etc. Three of your Board Members are Cabinet Secretaries -- DOF, DOE, DENR. They all have twitter accounts. Thank you. 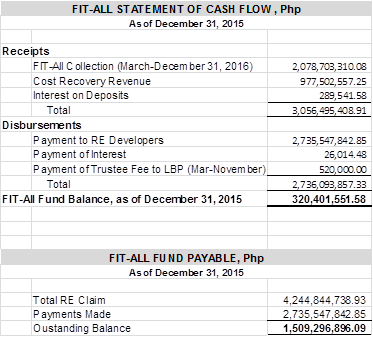 Today, I received a reply from Transco, they sent me two tables, the FIT-All cash flow and fund payables as of end-December 2015. They also gave me the name of the person I should talk to, the office local tel. no. Thank you Transco. I still need the list of companies that received and about to receive the FIT-All. I will call next week. 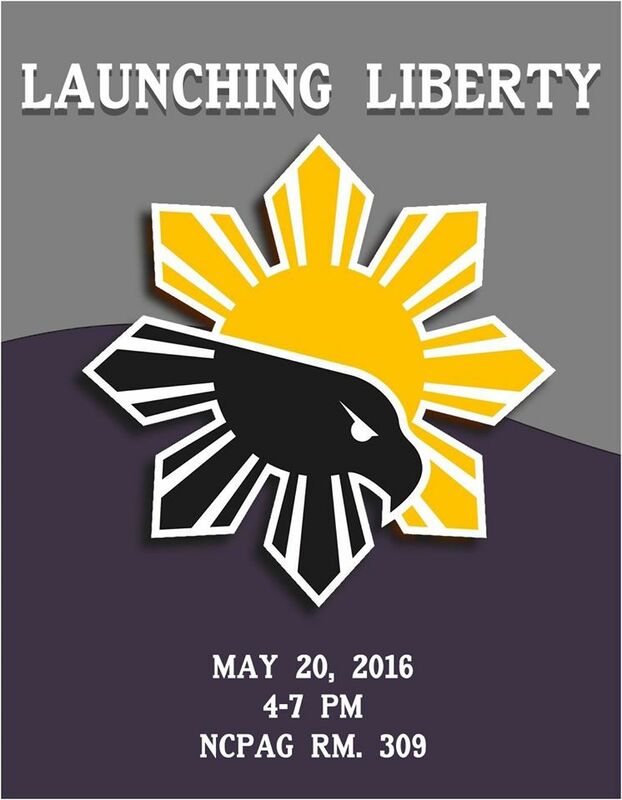 The first and only free market student organization at the University of the Philippines, UP Libertad, will be launched this Friday, May 20, at UP NCPAG, Diliman, QC. 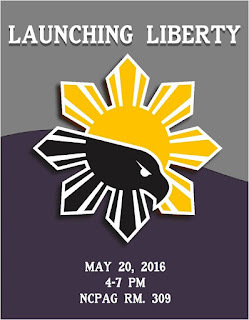 There will be two lectures, one by Mr. Thomas Laughlin, an alumni of the Students for Liberty (SFL), an international organization, and about Friedrich Hayek and “The Constitution of Liberty”. I will give the 2nd talk. These guys discovered the philosophy of individual liberty, then set up the group on their own, no external assistance or intervention. Although the convenor was communicating with me while they are in the process of formation, and I met them about 3 weeks ago in UP. 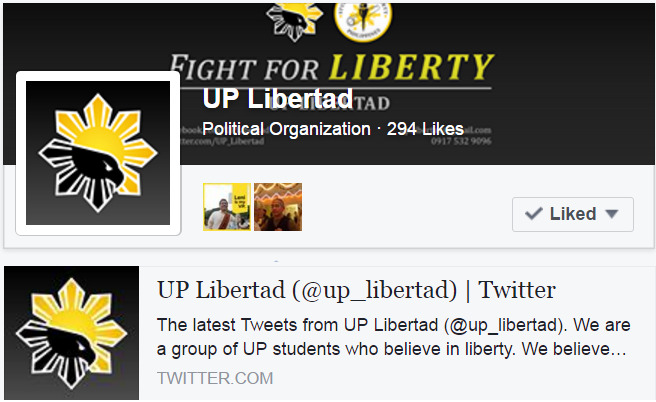 They have a facebook page and twitter accounts. Being a firm believer of spontaneity, diversity and inequality, I am happy to see the spontaneous formation of this group. I am sure these guys will dream big and aim high, at least in university politics and battle for ideas. Friends and readers, I hope you will consider supporting this new organization via donation, other forms of support. Thank you. * This is my article in BusinessWorld last Thursday. Energy poverty can kill today, not 30 or 100 years from now because of “man-made” warming or climate change. Dark streets at night because of expensive electricity and unstable energy mean more road accidents, more crimes. Or households using candles are courting more fires, more destruction to private property. And households using traditional biomass for cooking endure indoor pollution and invite various respiratory diseases. Thus, it is unwise for governments to institute measures that will make electricity even more expensive and make the construction of power plants become more costly and bureaucratic. Depriving the people of more access to cheaper electricity and stable energy sources is violation of their human rights, the right to live in safe communities, and road travel at night, the right to productive work and studies, the right to entertainment with families and friends, anytime they like. Consider the following data on energy poverty in the ASEAN from the International Energy Agency (IEA) and the Economic Research Institute for ASEAN and East Asia (ERIA). 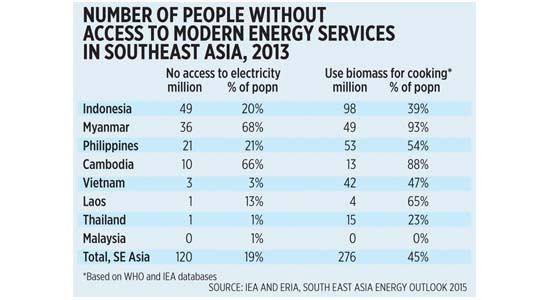 We exclude Brunei and Singapore in this list because they have 100% provision of energy for their people (see table). In 2013, some 21 million Filipinos were still using candles or noisy gensets at night, consuming more diesel, another fossil fuel. And some 53 million Filipinos were still using firewood and charcoal (meaning more illegal cutting of trees) for cooking, or cow dung, causing more indoor pollution and respiratory/health problems later. Is this a good situation for the country and our people? Maybe if one advocates de-industrialization and low standard of living as much as possible, the answer is yes. This means that we should cut our carbon dioxide (CO2) emissions by 70% compared to a business as usual (BAU) scenario. How will several industries be adversely affected? Mainly through more expensive electricity as more expensive, subsidy-dependent renewables like wind and solar will be forced-fed into the grid and distribution utilities. 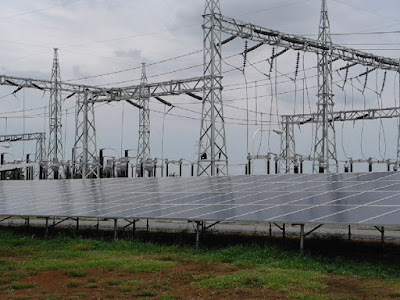 Even if cheaper electricity from coal and natural gas plants are available, they will be second priority when power from intermittent but expensive sources are available. So our monthly electricity bills will keep rising. Also, more electric tricycles and jeeps will be fielded via tax-funded programs, like the ADB loan of $300 million (around P17.2 billion) for 100,000 new e-trikes in the country. Purchase of e-trikes is borne by taxpayers, their daily electricity charging is also borne by taxpayers via charging stations in municipal/city halls. And firms will be forced to procure more capital-intensive processes, meaning higher operational costs to be passed on to consumers in the form of higher prices of goods and services. The Philippine Chamber of Commerce and Industry (PCCI) early this month wrote to the CCC questioning that commitment of a high target, 70% GHG emissions by 2030 as this will put undue pressure on local industries and strain the growth of the economy. The PCCI said, it supports GHG emission reduction but that “high target” is impractical. Their proposal was 40% reduction. Good call by the PCCI. Expensive energy, costly prices of commodities and services, should be among the last things that we should aspire for our people. Those alarmist scenario of “more severe weather”, “unprecedented, unequivocal global warming” and catastrophic “man-made” climate change remain questionable. Climate changes from warming to cooling to warming to cooling, in natural and endless cycles, since the planet was created some 4.6 billion years ago. Consider this data for instance (see chart). 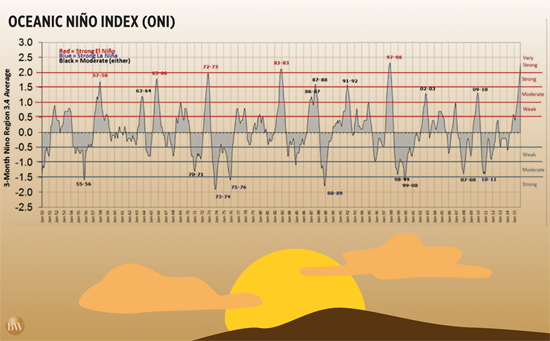 The big or very strong El Niño of 2015-2016 has a precedent, the big El Niño of 1997-1998. And almost always, big El Niño is followed by big La Niña, see the early ’70s cooling and the prolonged La Niña from 1998-2000. Continued demonization of CO2 -- a useful gas that we humans and our animals exhale, the gas that our plants, trees, and crops use to produce their own food via photosynthesis -- is creating more distortions in energy and economic policies. We should not aspire to rival Myanmar and Cambodia, much less North Korea, in energy poverty. Government -- through the CCC and DENR especially -- should get out of overly ambitious alarmism in energy rationing. This subject was not highlighted in the recent Presidential elections but President-elect Rodrigo Duterte was quoted in one forum during the campaign period that he supports more coal power plants to sustain the country’s rising energy needs. Let us hope that he will stick to this policy. 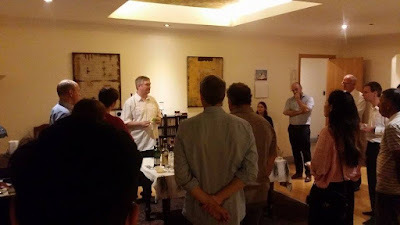 Last night, Friedrich Naumann Foundation for Freedom (FNF) Philippines Country Director Jules Maaten conducted and hosted a "whisky workshop". My first time to attend such kind of activity as I am a barbarian when it comes to some high end drinks, European whisky brands. It also served as Jules' farewell party to some friends. To my right here will be his successor, incoming Country Director Wolfgang BL Heinze. 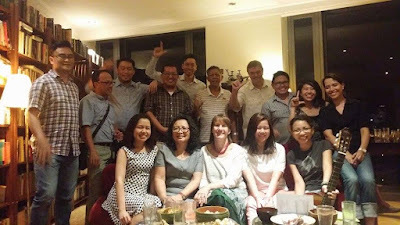 I talked to Eva, Jules' wife, she said she wished they won't leave the Philippines because of so many friends they have developed the past 6 years (though it seemed like 3-4 years ago when Jules came here to replace Siggi Herzog who became a Regional Director of FNF). But she's looking forward to a new adventure, new friends in S. Africa, Jules will be overseeing FNF's work in several countries south of that continent, many of which are really economically undeveloped and politically repressed. Injecting the philosophy of economic freedom and individual liberty in the minds of the people and politicians there will be a tough job. Another pose. 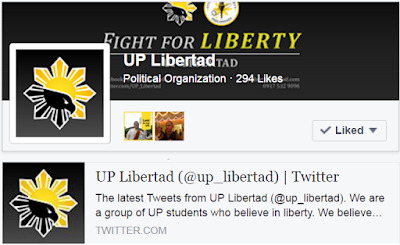 L for Leni Robredo and the Liberal Party (LP). The other guests that night, mostly Europeans, have already left when this group photo was taken. 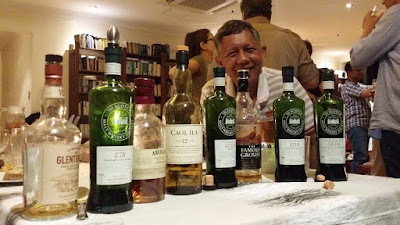 The workshop consisted of Jules discussing each bottle, their properties and taste, where they are produced, then people taste it, fellowship. After about 10 minutes, Jules calls the crowd again to discuss the next bottle. I think this is the "amoy sapatos" whisky that Jules discussed. Later I shifted back to beer. Good that Jules has a stock of San Miguel pilse at the fridge. Below, Mikael de Lara and Samuel's daughter leading the guitars and songs. U2's "with or without you", others. Before leaving the place, almost 12 midnight, I gave an unsolicited, impromptu speech discussing the role of FNF in general, and Jules in particular, in my field -- the free market think tanks and NGOs in Asia through the Economic Freedom Network (EFN) Asia. FNF is known more for helping liberal and democratic political parties like the LP via the Council of Asian Liberals and Democrats (CALD). 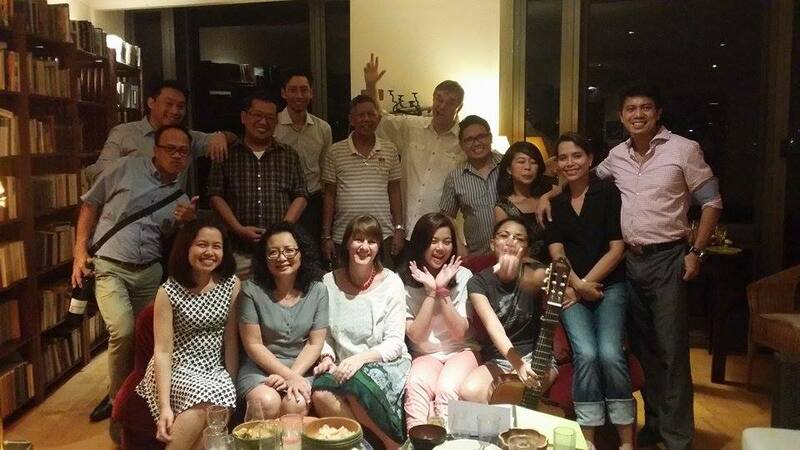 Nice food, including different types of cheese, drinks, singing, impromptu concert by Noel Cabangon, etc. Thanks again Jules. Photos mostly from Bing Salvador. Thanks Mikael for the ride. 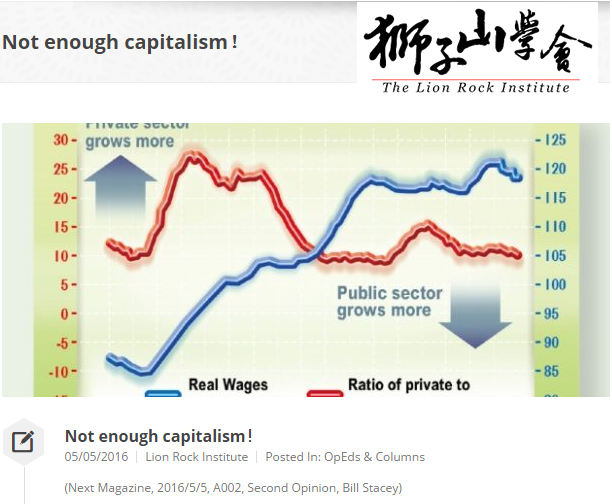 A good article by Bill Stacey, former Chairman of Lion Rock Institute (LRI) in Hong Kong. Reposting here. It is all too easy to blame China and the emergence of labor competition, but this would be wrong. Low cost wages were a factor in China well before our stagnation. Wages have been rising rapidly in China recently. China has enhanced our productivity and allowed our higher value added industries to take root. It would be fashionable, but equally wrong, to blame inequality.The real cause of stagnant wages is insufficient capitalism. Capital is the life blood of the economy. When entrepreneurs figure out new products and better ways of delivering goods and services that customers want, they must invest in machinery, equipment, and intellectual property development. Those investments allow workers to be more productive. In the jargon of economists, as the “marginal productivity of labor” increases, the wages that can be paid go up. Highly productive labor can strike a better bargain with better terms and conditions. Very valuable labor negotiates better pensions and working hours or more money as they wish. It is important to understand that it is not just the skills and education of working people that determine their productivity; it is the interaction between their efforts and the capital that their efforts command. If capital is inadequate, business models archaic, or entrepreneurial innovation insufficient, the talents and education of the population will not be enough to deliver rising incomes.Let us take for granted that our people are at least as talented, skilled, and well educated today as they were 30 years ago. What hampered wage growth is our capitalism that is increasingly tied in regulatory knots as compared to the past. Last year our private capital investment shrank by 8%, whilst public capital investment grew by 7%.As the accompanying chart shows, periods of wage growth were preceded by periods when our private capital investment was much higher than our public capital investment. It can take years for private investments to lead to the advanced businesses that allow wages to rise. Our wealth today is built on the entrepreneurial investment of the past. However, when public capital investment is high compared to private investment, then wages tend to stagnate. This is the opposite of the story that we are told by officials. They will say that when the private sector is weak, the public sector needs to step in to make up for the slack so as to keep the economy on track. Many will even argue that massive public investment in infrastructure is a vital precondition for the private sector to grow.The trouble is that public investment does not deliver on its promise. It needs to be funded by taxes, so higher public investment leads to higher expected future taxes and less private investment. Public investment is more wasteful as it crowds out cost-effective private sector investment. Public projects are prioritized by political decisions, not markets, so they are often chosen to gain votes rather than profits. More importantly, periods of high public investment are often times when there is enthusiasm for more regulation and government interventions, which are inimical to entrepreneurial investment.Why is private capital investment so weak that it is not supporting the same productivity and wages growth that we generated in the past? Regulation is part of the picture. Long term investments require you to know the rules of the game. Stable rule of law is a precondition for strong private investment. Incentives are vital. If bidding for a government privilege or subsidy is more profitable than investing in better capital, investments will not be made. Too many of our entrepreneurs are on an Ayn Randesque strike, so wages will not rise and our discontent will not pass until we rebuild our capitalist foundations. Congratulations, COMELEC, for a generally peaceful, credible, and fast results elections 2016. Congratulations, unofficial President-Elect Rodrigo Duterte. The people have spoken, you got nearly 40% of the national votes based on the SWS exit poll. Bongbong Marcos is leading by 0.12 million votes as of this writing, no congrats yet. 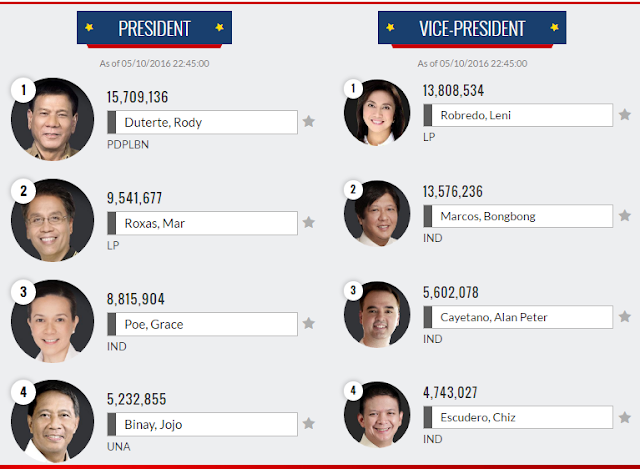 I still hope that my candidate Leni Robredo will beat you in the coming hours or days of official counting. 1. 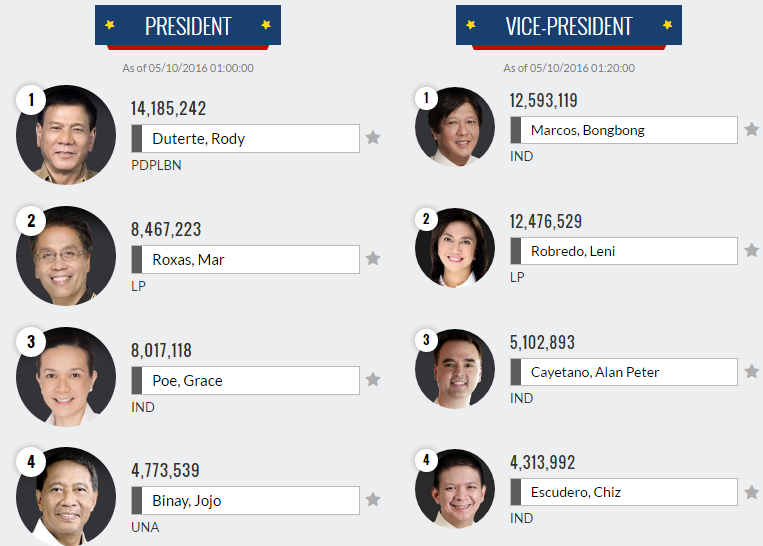 VP Jojo Binay finally loses in an election. He and his family were the alternating Mayors of Makati City (he, his wife, he again, then his son) for almost 30 years, then he won the VP race in 2010. 2. Securing the people's right to life (against murderers, rapists, kidnappers), right to private property (against thieves, land grabbers) has trumped the politics of welfarism and rabid environmentalism. Duterte's single issue on fighting criminals proved to be more important to many voters than the promises of endless welfarism by the other Presidential candidates. 3. 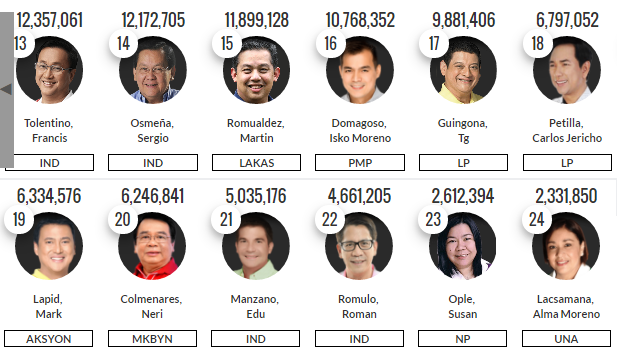 Among Senatorial candidates, populist lefties like Colmenares of Bayaan Mo Na and Walden Bello of Akbayan are losing. These two are rabid advocates of socialism, explicit or implicit. 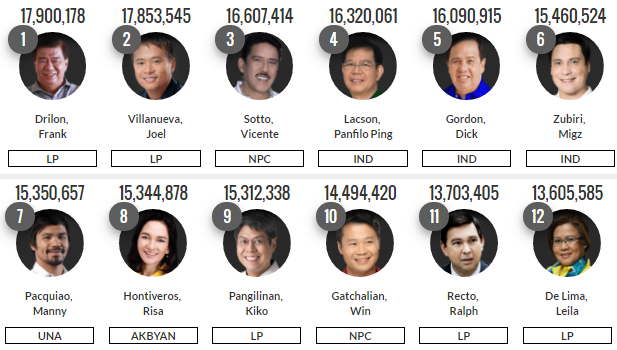 Risa Hontiveros finally made it after losing consecutively in 2010 and 2013 Senatorial elections. She's speaking mostly populist and socialist-leaning but her pronouncements are tempered by her direct association with the LP machinery which is definitely non-leftist. 2. Manny Pacquiao will become Senator while Serge Osmena and TG Guingona are losing. Manny is a great man as a boxer and ring fighter. But later he has evolved into sort of a megalomaniac person, jumping into many activities outside of his core competence. Very good in boxing, but lousy as a professional basketball player, lousy singer, lousy Congressman. So he will soon be a lousy Senator? Sen. Serge has a good sense on energy policies, sayang kung matalo sya. Nonetheless, the important thing is that the elections was held generally peacefully and orderly, it looks credible mainly because of fast turn out of electronic results. We can move on. Work with the next President with a big mandate and support from the voters. Pero please lang, next President Duterte -- learn to respect the rule of law, let there be due process before penalizing criminals. Some may have stolen just a few chickens but short-cut investigations and penalties would say they stole cows and tractors and hence, the penalty is outright execution or "salvaging". Learn to respect human rights. Kawatan man yan, may existing system of penalties na dyan, like X number of months or years of imprisonment, not outright execution and government-sponsored murders. Lastly, President-Elect, while you said you were a fan of socialism and BIG government, at one time you also said you want a "minimal government." I hope you will lean more towards the latter and not the former. Thank you. Update, as of 10:45 pm. With 94.3% of national votes counted. 4. Grace Poe, Mar Roxas and Jojo Binay already conceded to Rody Duterte. He retains the 6+ M lead votes over Mar Roxas. VP candidates Chiz Escudero and Alan Cayetano also conceded defeat. Good move guys. No more hassle and complaints of irregularities or cheating. First time in Philippine elections that all major rivals have conceded defeat to a leading Presidential candidate less than 24 hours after the polls have closed. 5. Leni is winning, she has overtaken Bongbong by 0.25 M votes. 6. Soon we will not see the faces of "no car plate, no sticker available" DOTC Sec. Jun Abaya and MIAA Administrator Honrado, known for his so-called ignorance of "tanim bala" or "laglag bala" extortion racket at the NAIA. Among the "downers" of the PNoy government. 3. Climate alarmism and renewables cronyism in the Senate will have additional voice through Migs Zubiri, strengthening Sen. Loren Legarda. 4. Francis Tolentino, currently #13, might edge out Leila de Lima now in #12... Tolentino is generally lousy as MMDA Chair, he used the position mainly for his Senatorial ambition and not to reduce high traffic congestion. Leila stood up against the Iglesia ni Cristo (INC) Edsa occupation dictatorship last year. These INCs closed down a busy part of EDSA for 3N/2D (from Friday night to Sun afternoon). Meanwhile, the PNoy bashers of "massive cheating to make Mar Roxas win at all cost", learn to have humility and own up to your irresponsible statements. The same goes for COMELEC bashers. I hope to hear your apologies guys. Not to me of course, but to the Comelec and the admin. Election 22, Is Du30 victory almost certain?